Bolivia is one of the world’s producers of Arabica coffee. While the Yungas (north of La Paz) is Bolivia’s traditional and principal coffee growing region, the country’s largest exporter is situated in the department of Santa Cruz – in Buena Vista, to be exact. A friend suggested to check out Hacienda El Cafetal, to visit the coffee plantation and factory and, of course, to taste some high-quality, organic coffee. The colonial town of Buena Vista is a popular weekend retreat for residents of Santa Cruz and Cochabamba, but more and more gringos – foreigners – find their way to Buena Vista as well. We immediately noticed that visiting Hacienda El Cafetal is a popular attraction: several agencies were offering tours.Since we have our own transportation we drove to the plantation ourselves, some five kilometers south of the plaza, and at the reception of Hotel El Cafetal, situated on the premises of the coffee plantation, we asked about the possibilities for a tour. Since we have our own transportation we drove to the plantation ourselves, some five kilometers south of the plaza, and at the reception of Hotel El Cafetal, situated on the premises of the coffee plantation, we asked about the possibilities for a tour. Too bad. It was the off-season. No production, no tours. But we could have a coffee though. Caretaker Juan had time on his hands, it was raining, so why not. 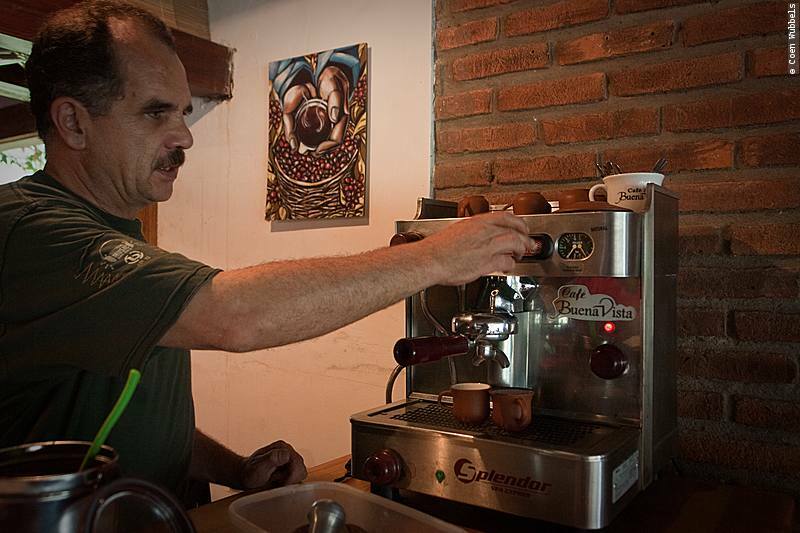 We ended up spending a large part of the morning in the bar, sipping hot and strong, organic espresso while discussing the history of the hacienda, organic vs genetically modified foods and the potential for eco-tourism. 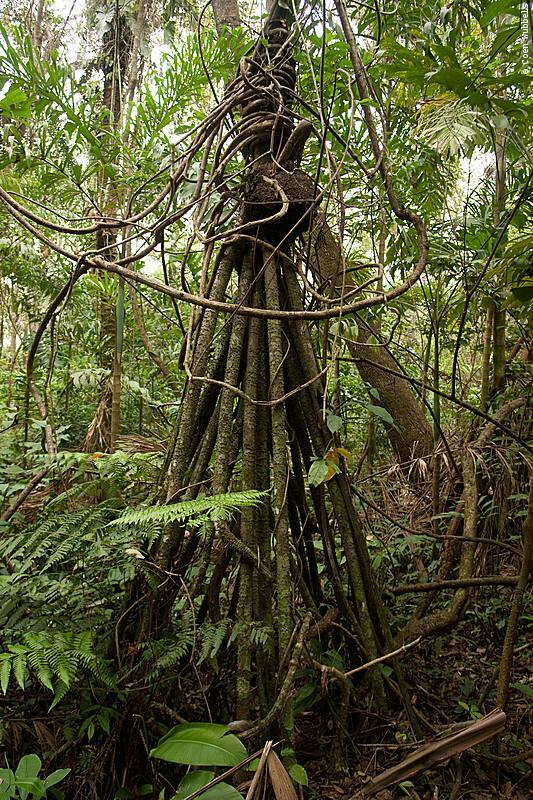 Tree called zancudos (‘daddy longlegs’). “Feel free to go for a stroll yourself,” Juan suggested, “It’s a lovely walk.”Juan was right: El Parque del Café, surrounded by jungle is a beautiful place for a stroll, passing along trees with air roots locally called zancudos (daddy longlegs) and red-flowering trees called pico de gallo (Cynometra cubensis, also known as the flaming tree). 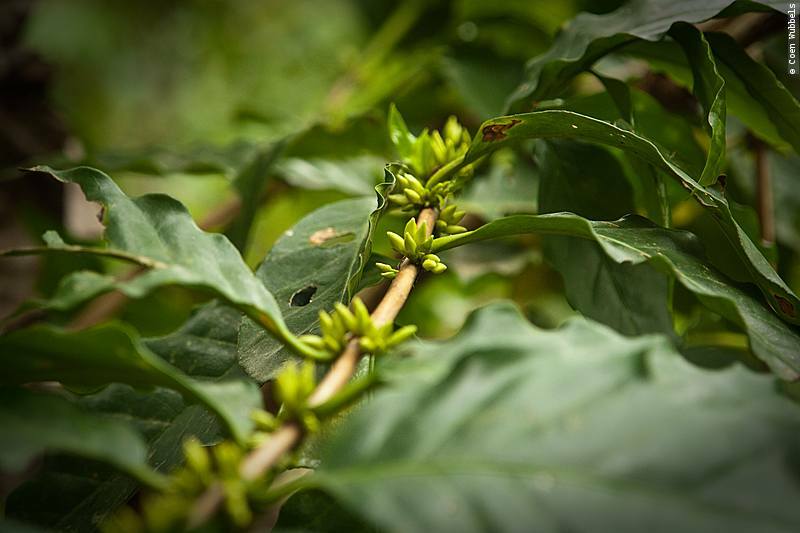 El Cafetal’s Arabica coffee plants grow in the shade of a non-native tree: the cerebo. However, this fast-growing tree doesn’t fare too well here and there are ideas under development of replacing it with bamboo or other shady, native trees. Part of the production area – La Planta de Beneficio – is outside. 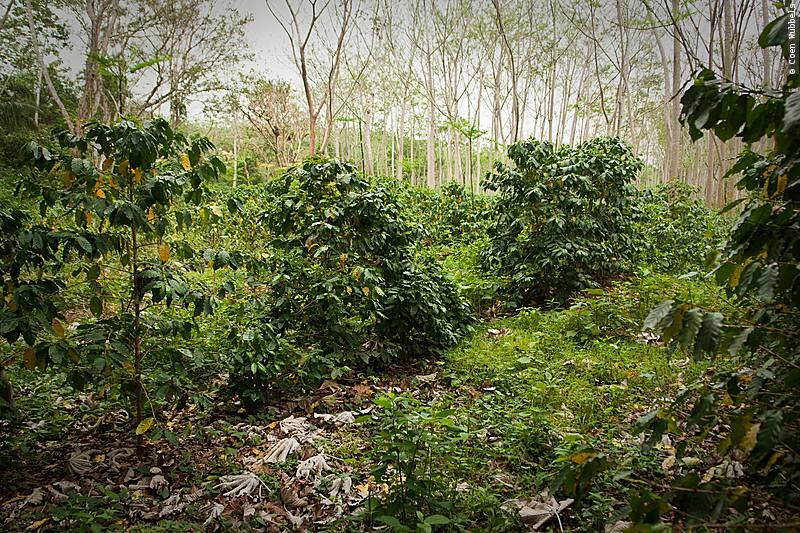 Here, coffee plants are cultivated and coffee beans are washed and dried. The roasting of the coffee beans is done in a large hall. For children there are excellent explanatory panels, on which each step of the process is explained by cartoons that humorously relate the life of a coffee bean. Adjacent to the plant is Hacienda’s outdoor café – which was now void of people except for us but during the high season it will be a perfect place to taste different kinds of coffee – with a small, well-set up museum where panels explain more about the making of coffee, the history of coffee, as display graphics about coffee production. We returned to Juan for another coffee who then showed us around the characteristic Hacienda with fantastic views of the Amboro National Park. Four spacious family cabins originally functioned as weekend retreats for the first owners of this coffee plantation. 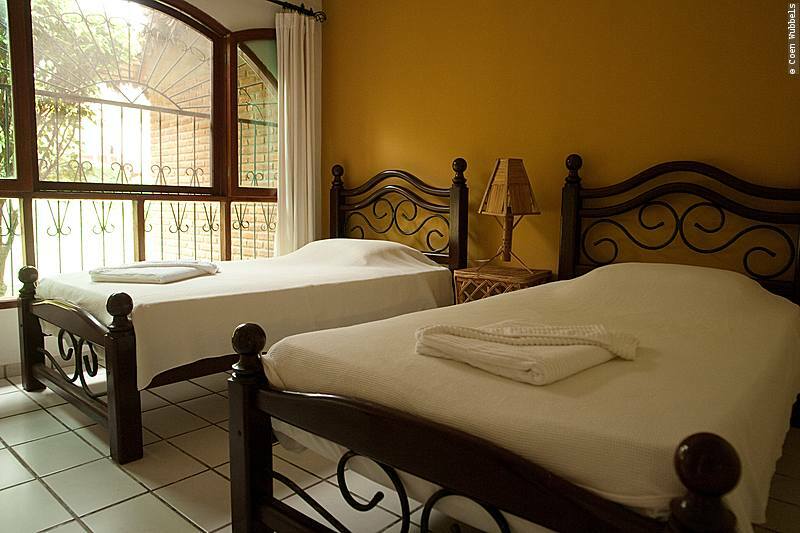 A couple of years ago the cabañas were transformed into a hotel and four more cabañas were added, each equipped for two persons. The cabins are located around the swimming pool and garden – a perfect playground for children. With any luck, you will be visited by one of the sloths that enjoy spending the night on the veranda of the cabin. 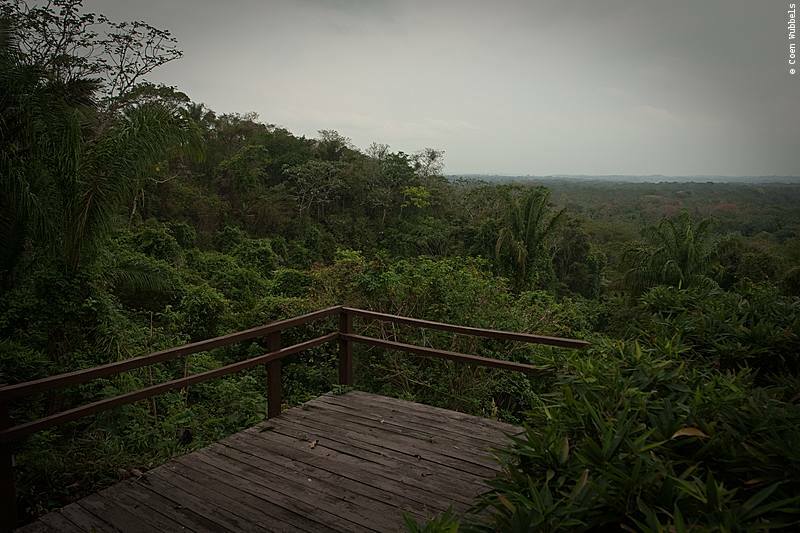 The big attraction of this place is the view of Amboró National Park; sunrises are a reason in themselves to rise early and walk onto the balcony for a spectacular start of the day. The best time for a one-hour tour at Hacienda El Cafetal is from April to June, during the harvest season. Bring insect repellent, a hat and, of course, your camera. You can buy several kinds of Buena Vista coffee here, organic as well non-organic. An excursion to Hacienda el Cafetal entails a long – but doable – day trip from Santa Cruz to Buena Vista (100 kms, about 2-hour drive) but you can also turn it into a multiple-day trip with an overnight stay in Buena Vista, which is a pleasant, small-scale town with a plaza to stroll and outdoor cafés to taste more coffee (or drink a beer). Other activities in the area: visit the adjacent Amboró National Park, Buena Vista’s cheese factory ‘Quesería Suiza’ or a nearby community where honey is produced. The cheese and honey are for sale downtown Buena Vista, as are locally produced handicrafts. This entry was posted in Bolivia Travel, Food, Projects & Organizations, Sightseeing by Karin-Marijke Vis. Bookmark the permalink. Mmmm, I’d like to go there. I think it was lucky you saw this in the off-season. It sounds peaceful. 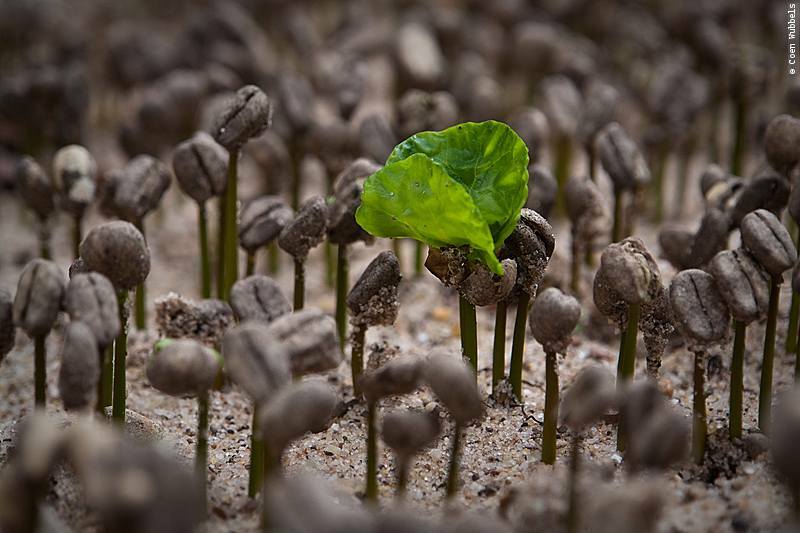 The baby coffee plants are really appealing in the picture. Thanks for this!